Nominations are now open for 19 Committee Members. Each existing valid member (both corporate & individual), may nominate not more than 19 names for the election. Please note that written consent of the Nominees (please use the prescribed Nomination Form attached) must be obtained before they are nominated for the election. Nominees should be stationed in Beijing for effective contributions to our operations. Please provide a brief introduction write-up of not less than 100 words for each Nominee. 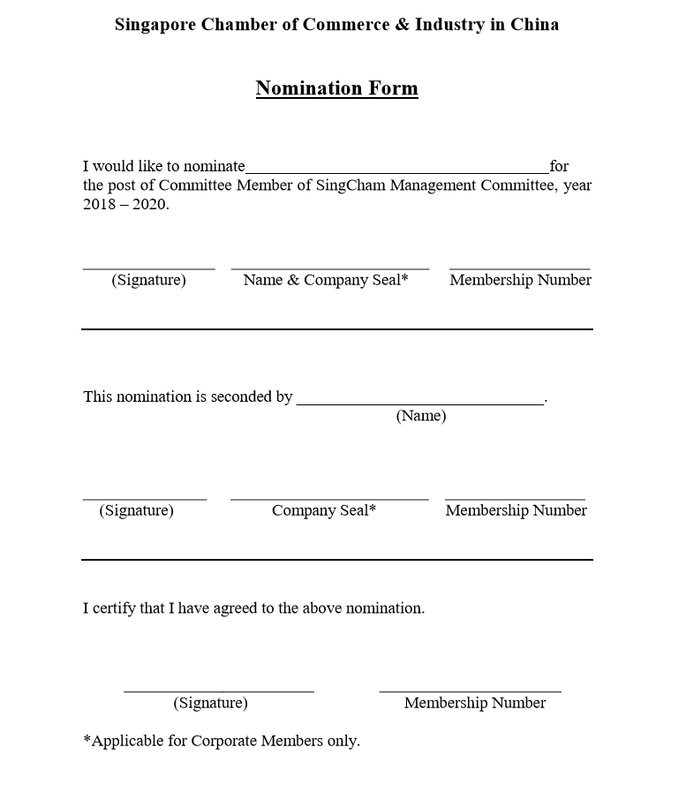 Kindly email the duly completed Nomination Form to SingCham office and the deadline for nomination is 9th May 2018 at 3.00pm. The Election Committee reserves the rights to change the nomination and election process in accordance with the provisions of the SingCham Memorandum & Articles and By-Laws.